1754-98. He was the third son of the Revered William Cornwallis, the rector of Chelmondiston, Suffolk, and of his wife, Sarah Cobbald. He was a distant cousin of Admiral Hon. Sir William Cornwallis. James Cornwallis was a distant relative of Commodore Hon. 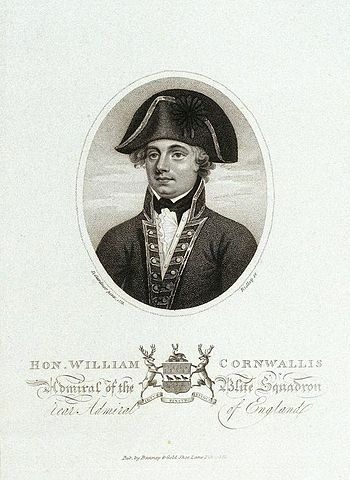 William Cornwallis, and benefited from his patronage. During 1774-6 he served off West Africa aboard the Pallas 36, commanded by his distant cousin, Captain Hon William Cornwallis, in which vessel he assumed the duties of acting second-lieutenant. The Pallas later saw service on the Jamaican station where he was commissioned lieutenant of the Squirrel 20, Captain Stair Douglas, by Vice-Admiral Clark Gayton on 9 July 1776. In April 1778, having returned to England, Cornwallis was appointed first lieutenant of the Chatham 50, commanded by Captain Cornwallis in home waters, but he left the post in the following month when his cousin found alternative employment aboard the Medea 28. In September he rejoined his cousin as the first lieutenant of the Lion 64, which went out to the Leeward Islands in December and fought at the Battle of Grenada on 6 July 1779. Having sailed to Jamaica for repairs the Lion had brief encounters with French squadrons on 20 March 1780 and on 20 June. He commanded Captain Christopher Parker’s frigate Lowestoft 32 on the Jamaican station from November 1780 for five weeks before removing at his own request to the Badger 14, being promoted commander with effect from 9 December 1780. For some time in the early months of 1781 Lieutenant William Sykes acted in his stead. Cornwallis was posted captain on 14 September 1781 although he retained the Badger until May 1782. During March 1783 he recommissioned the Iphigenia 32, conveying the Earl of Northington to take up the viceroyalty in Ireland, then taking her out to Jamaica in November where she remained for three years before paying her off at Sheerness in October 1786. In October 1788 he was appointed flag-captain to his cousin, Commodore Hon. William Cornwallis, flying that officer’s broad pennant aboard the Crown 64 which he fitted out at Chatham for the expedition to India which left in the following February. In September 1790 he sought permission to return home on account of his poor health. In March 1798 flying a broad pennant aboard the Sheerness 44 he went out to the coast of Africa, but he died at sea from a fever on 31 July. He was succeeded by Lieutenant William Hanwell, who in a move that was only legitimate on the African station, elevated himself to the rank of post captain.